I had HWiNFO running all day without any problems. I played around with SpeedFan and AMD Overdrive and HWiNFO was still running fine. I then closed it and wanted it to open shortly after and was greeted with an error message that it can't install its driver. Is there any way to check what is keeping from HWiNFO to load its driver? I'm pretty sure a reboot would fix this, but my computer is busy right now and also I want to avoid this in the future. Before launching the scan press Settings -> Driver Management. Try to install/remove it via those options. Alternatively you might then use the "Persistent Driver" option so that it remains installed. Thank you for your suggestions. In the meantime I found out why this happened. I had just installed the Catzilla benchmark and merely being in its menu already blocked HWiNFO from loading the driver. Strange. Once I closed Catzilla, HWiNFO started without a hitch. Another question I don't want to open an additional thread for: On a different computer HWiNFO shows for every drive a "Drive:"-section that lists read and write activity. I can't see that on my desktop at all. All I get to see of my hard drives is the SMART-status section for each drive. Is that a bug or did I overlook to activate an option somewhere? Catzilla is internally using the HWiNFO SDK, so that might be the reason why. Drive activity should be visible for all drives. What kind of drives do you have on that computer and what operating system? (08-01-2014, 08:05 PM)Martin Wrote: Catzilla is internally using the HWiNFO SDK, so that might be the reason why. (08-01-2014, 08:05 PM)Martin Wrote: Drive activity should be visible for all drives. What kind of drives do you have on that computer and what operating system? I have a Samsung 840 EVO SSD (512GB), a Samsung HD321KJ (320GB), a SanDisk SSD CZ80 64GB USB stick and a VHD which hosts the operating system, Windows 7 x64. Anything extraordinary on that system which might block direct access to those drives? (08-01-2014, 11:06 PM)Martin Wrote: Anything extraordinary on that system which might block direct access to those drives? Not that I know of. I "lited" this Windows version, so may be that could be the reason, but unless HWiNFO accesses some extraordinary API which might have been removed, I can't really think of something that could block access to the drives. fsutil provides a similar functionality and has no problem doing so. I didn't experience this bug when booting off of the SSD, but since the SSD is brand new it could happen that this bug shows up at a later time when using it as a boot drive. If you don't have the "Fixed order" option in Sensors/Layout enabled try to do so. You might also try to press the "Restore Original Order" button to see if that fixes it. Is it normal to see two lines of the same temperature for the HD321KJ-HDD as you can see in the above screenshot? 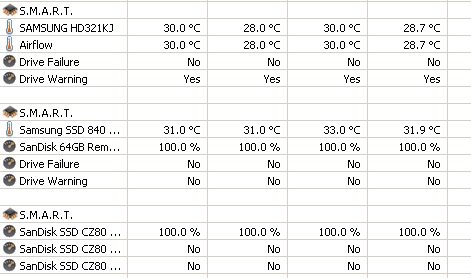 (08-03-2014, 01:20 PM)Mexxxi Wrote: Is it normal to see two lines of the same temperature for the HD321KJ-HDD as you can see in the above screenshot? Yes, some drives report 2 temperatures, though in most cases I have seen they are the same.